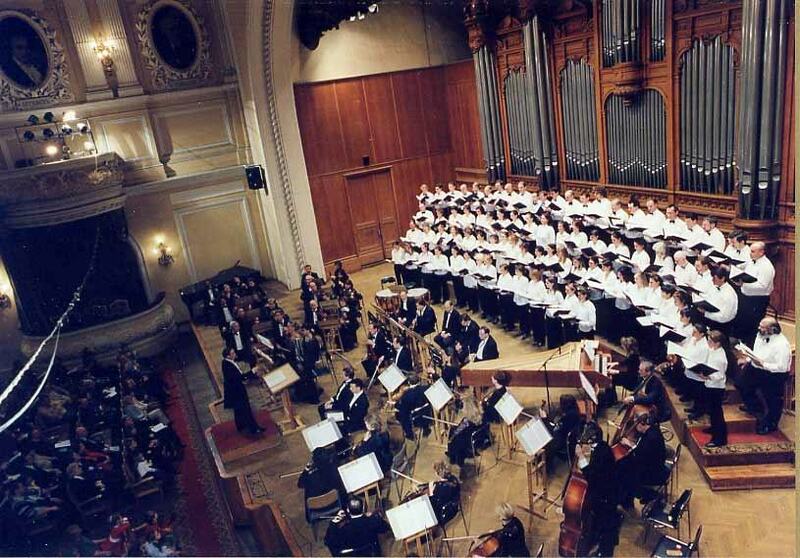 The Moscow Oratorio Society came together at a time when life in the Russian capital was in a state of rapid and exhilarating change in the aftermath of the end of Soviet communism. The birth and evolution of an independent cultural organization like this choir with its diverse international membership can, in many respects, be seen as part of this process of change, a significant expression of the general development of new forms of civil association and of the breaking-down of barriers between Russians and foreigners that this city has witnessed over the past decade. 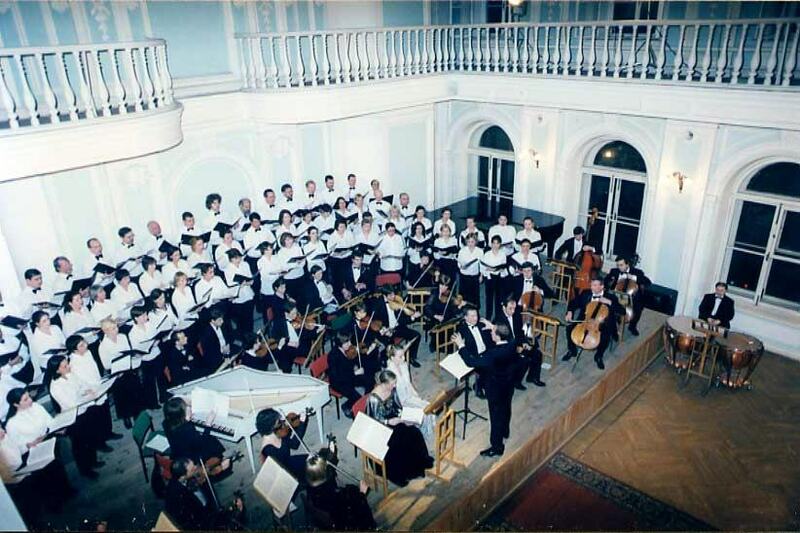 The choir began life in 1993 when two English journalists in conversation at a Moscow party decided that it would be a good idea to fulfill a native tradition of long standing by singing Handel’s Messiah at Christmastime. The first performances were held in Saint Andrew’s, Moscow’s Anglican Church, and were festive and memorable community occasions attended by the American and British Ambassadors. In those early performances, the choir was accompanied by student orchestras and Russian, English, and American soloists. Since that time, the Oratorio has kept up the tradition of singing The Messiah every year. In the years since, however, under the direction of Alexander Tsaliuk, the Oratorio Society has grown and changed, undertaking new and exciting musical projects, and drawing strength and financial support from many sources. The choir’s primary aim is to give amateur singers from all backgrounds and with all levels of musical experience the opportunity to perform great music to a high standard in some of the most visually and acoustically beautiful venues in Moscow, and also to enjoy the company of a diverse group of people with a shared love of music and inter-cultural exchange. In the past we have sung in the White Foyer of the Bolshoi Theatre, the Gnessin Institute, the Rakhmaninov and Great Halls of the Moscow Conservatory, and other concert halls in Russia’s capital. Over the years the choir has sung a wide repertoire ranging from Bach and Handel to Mussorgsky, Gershwin and Bernstein. We have been accompanied by some of the city’s finest chamber orchestras, among them Musica Viva, The Moscow Conservatory Opera Studio, and the Gnessin Virtuosi, as well as soloists from professional companies such as the Bolshoi Theatre, the Stanislavsky Opera Theater and the Moscow Philharmonic. The Moscow Oratorio Society welcomes singers of all levels of experience, requiring of them only a love of music and a sense of commitment. While some of our singers are very experienced musicians, others had only limited exposure to choral singing. In the past the choir has included members of the expatriate business and journalistic communities and the diplomatic corps as well as many Russian singers. Rehearsals are conducted in both English and Russian with a professional accompanist. Our members enjoy the friendly, multicultural atmosphere of rehearsals, which, while musically demanding, also provide an opportunity to meet and develop friendships with people from other countries who share an interest in music. The choir traditionally performs two concerts a year, one before Christmas and one in the spring. The rehearsal season begins in early September and late January. Rehearsals are held on Wednesday evenings between 7 and 9.30, with an additional weekly rehearsal in the few weeks leading up to a concert. Singers are invited to contribute a modest membership fee each season. The net proceeds from concerts and sponsorship are donated to various charities of Moscow, including those of the International Women’s Club and the Salvation Army. Both these groups support marginalized populations in Moscow.